The Domino sure makes joinery easy: fast layout, cutting parts directly to length, mortises in a flash, no fussy trimming of tenon shoulders, and no trips to the sharpening bench. This may come at a price, however, if you fall into the seductive trap of machine woodworking, which is letting the limitations of the machine govern too much of the aesthetic and structural design. Let’s look at some possible frame or rail joints made by the Domino DF 500. 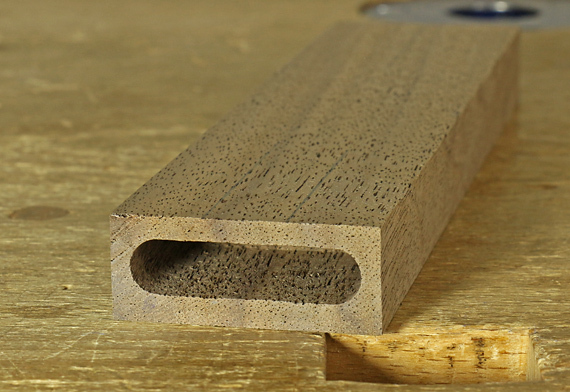 The photo above shows the “tenon” half of the joint where the long grain of the Domino matches that of the frame member. The two on the left are fine by me. The third from the left is marginally acceptable. The one on the far right is awful. A little arithmetic backs up what I think most of us would intuitively see as a waste of potential glue area in that last joint. The flat width of the Domino is 13.7mm, or 0.54″, irrespective of its thickness. With a tenon insertion of about 1″ (half the length of the 50mm Domino), we get a total effective glue area of about 1/2 square inch x 2 (for both sides of the tenon) = 1 square inch. I don’t count the rounded areas because they are not good glue surfaces. At the other extreme, since the rail is 1 ⅞” wide, a slip joint or full tenon would give about 7 square inches of effective glue area! The demands of the design might not need all of that, but giving away 86% of the potential glue area is too much to sacrifice for convenience. I want my work to last. How can we increase the glue area, at least somewhat, and retain the convenience and speed of the machine? As an example, in the photo below, on the right, the same 1 ⅞”-wide piece has two slightly overlapping Domino mortises. I simply trimmed the Dominos on their inner edges with a block plane to make them fit. 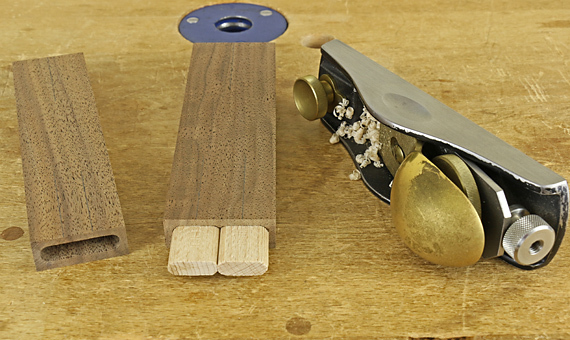 The piece on the left (the marginally acceptable one in the top photo), as another example, has two mortises that overlap a lot to make one wide mortise, wider than widest setting on the machine. It would be easier to make a loose tenon for this than to divide Dominos. 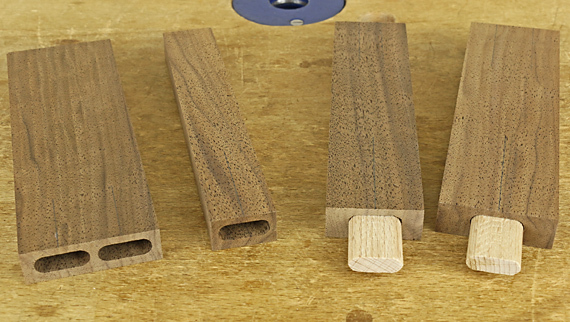 To get the Domino machine to chain together small mortises into a neat, continuous mortise that has no steps in the walls (photo below), the fence must be exactly parallel to the motion of the bit. My Domino DF 500 – yes my $800 Domino – did not meet this level of accuracy. The machine cannot be adjusted for this, so I carefully shimmed the fence. That was complicated because the shims have to essentially create a new fence surface that is at a very slight angle to the original one. 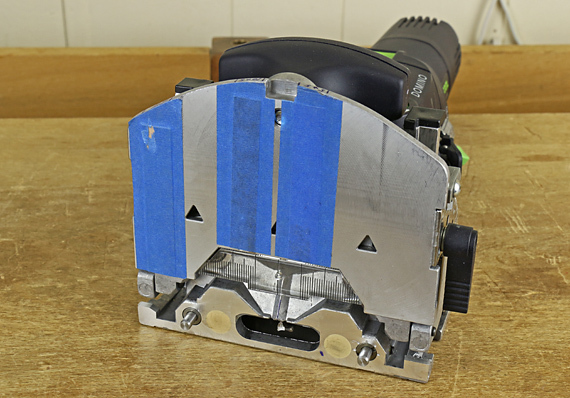 I had sent sample mortised pieces to Festool but they told me it was within tolerance. Well, it was not within what I tolerate in my work. This is not a tool review, it is simply an account of my experience with the machine I bought. 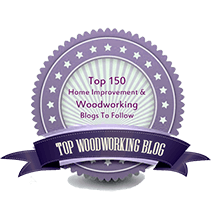 The general point of all of this is to take charge of your woodworking machines, and not let them lull you into woodworking that you know is second-rate.